I obtained this border from Perfection Type a while ago and am kicking myself for not buying all of it. After a bit of digging I cannot seem to come up with what it’s called other than certificate border or if it’s in production anywhere. Would anyone in the briarpress community be able to assist further? A picture would be helpful. Oh, apparently it didn’t attach. Take two. Perhaps also “coupon border”. 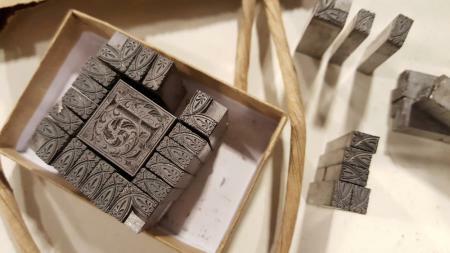 All the Monotype-based foundries sold handifonts of this, but not in identical assortments as there are at least three suitable corner piece designs. Some of the corners are for lengthwise use of the border units. M&H would still have their selection, maybe Quaker too? I don’t see it at Skyline but it was at LA Type, so maybe the mats made it to Skyline. 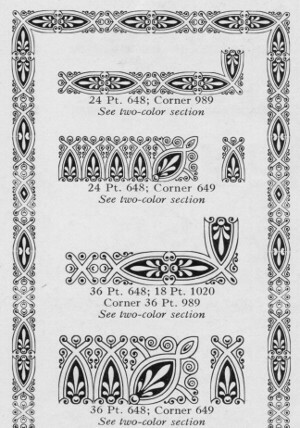 If you don’t have a Lanston specimen book (or even if you do), I would strongly recommend getting a copy of Ed Rayher’s compilation “Ornadementia” (which includes much of the Lanston decorative material). Finding this border in it (assuming I did find the right border) took all of 15 seconds. Very handy. His contact info is on his website, http://www.swamppress.com/ At one point, Letterpress Things stocked it as well (not sure if they still have it). Possibly contact Mr. & Mrs. David and Claire Bolton @ *The Alembic Press* in the U.K. They have accrued and published the most comprehensive archive,s and records of virtually every aspect of Monotype (Hot Metal). Outside of the American arm of the Lanston Monotype Corporation,s unit based in the Old/Ex Monotype works/cottages, at Salford In Surrey, who also may be of assistance. possibly.? Probably listed as *Monotype Imaging*!! Apparently I’m as blind as a bat, I thought I had dug through M&H’s catalogue a tad better than it seems. I looked right past it at least half a dozen times. I’m going to contact Quaker for sure and see if they have a larger selection than M&H, Skyline/Swamp don’t offer it. You are indeed correct, thank you for the images and recommendation, I shall indeed order one. 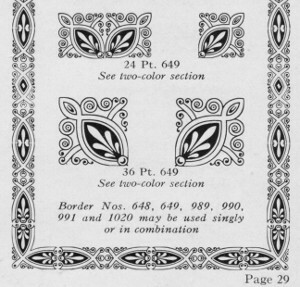 I have seen this border in Inland Printer foundry ads that predate the Monotype Company so this started out as a foundry product from the 1880s/90s. It was cast and sold by Kelsey for many years. The same border appears in an auction catalogue I have dated 1876. I suspect it is much older than that. I was just looking through a reprint copy of the 1848 Geo. Bruce & Co. catalog and found it shown there. My guess it that is of European origin previous to that.